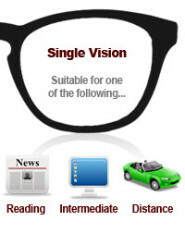 Single vision lenses have a single focal point throughout the entire area of the lens. They are the most commonly used lenses and can worn by people that are short-sighted, long-sighted, astigmatic or even just as reading glasses. 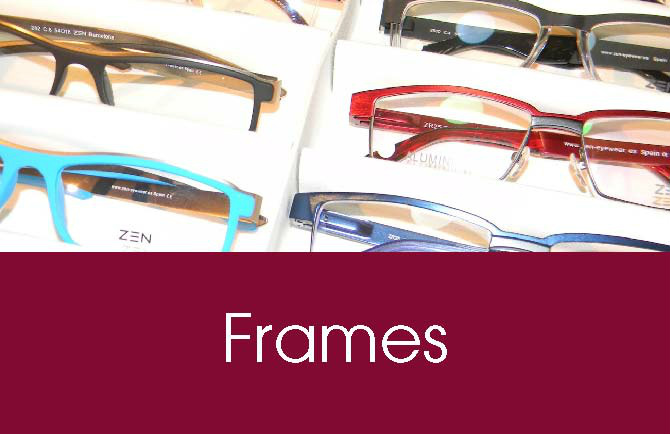 They are suitable for any age group and can be used for distance or near vision. Bifocals are essentially a 2 in 1 lens, i.e. they have 2 focal points in 2 separate parts of the lenses. These parts are separated with a segment line. The top part of the lens is used for distance vision whereas the lower part of the lens is for near vision. These are usually worn by presbyope's that require distance spectacles as well as near. Nowadays we are spending more and more time looking at a screen. This doesn't just include a computer screen but also mobile phones, laptops, tablets and digital cameras. Prolonged use of these screens can sometimes lead to eye fatigue, as well as neck and back strain. Single vision near spectacles may not suit everyone's specific work environment. This is where occupational lenses can help. These lenses are designed to help the wearer have a more comfortable vision at different working distances. 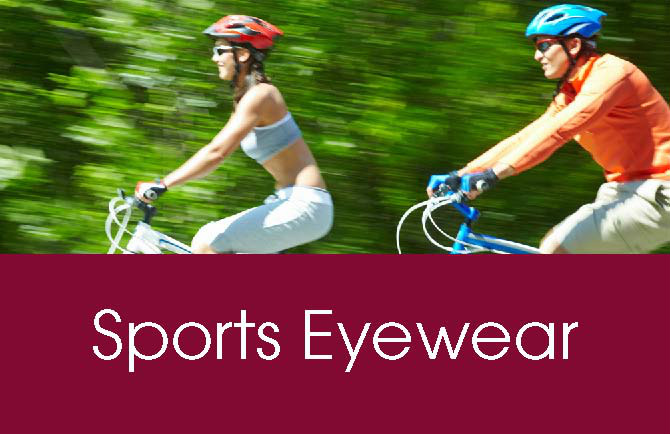 They are designed with the full near prescription towards the bottom of the lens and reduce in strength as the eye looks through the middle and top of the lenses. This means that the wearer can see up close and at arm's length in one pair of spectacles without it being a pain in the neck! High prescriptions in standard index lenses can lead to thick heavy lenses that can have poor visual optics and cosmetic appearance for the wearer. To solve this problem, one can increase the index of the lens to make them thinner and lighter. 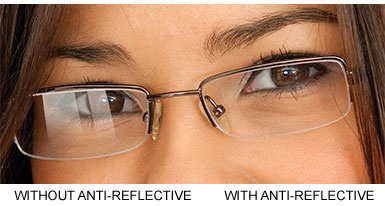 This not only helps the wearer see clearer but they also look cosmetically better. Standard Plastic CR39 lenses are usually a 1.5 index. Moderate index lenses are higher at a 1.6 index . High index lenses are 1.67 and very high index is 1.74 index. The index of glass is highest index at 1.9. Polycarbonate lenses are more impact resistant than standard CR39 lenses. 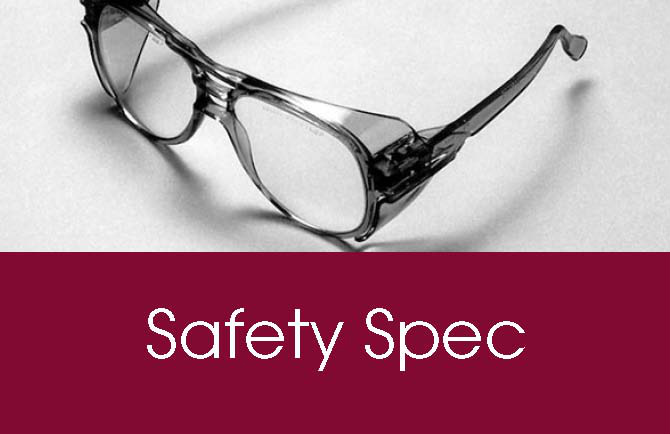 They are usually used in safety spectacle as well as supra and rimless frames. These lenses are also lighter than standard plastic lenses. The safety characteristics of these lenses also make them very suitable for children's spectacles. Hard Coated; A hard coat on a lens makes it more scratch resistant. Standard plastic lenses are a soft material, thus they can scratch easily when compared to glass material. 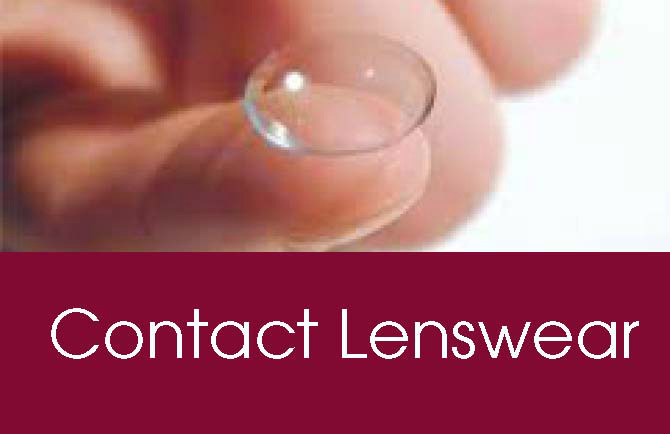 A higher index lens is a softer material therefore it becomes necessary to apply a hard coat to increase scratch resistance. Anti-Reflective; This coating increases light transmission and reduces light scatter. This improves image contrast and colour saturation as well as reducing reflectance from front surface of the lens. This makes the lenses more cosmetically appealing as well as improving the quality of vision. It also helps reduce glare and eye fatigue from screens such as computers, phones, cameras and tablets as well as the annoying glare experienced during night driving from oncoming headlights. Sun damage does not just occur on our skin, our eyes are also at risk from the harmful UV rays. Just as we protect the skin with sun block, we should also protect our eyes with adequate lenses. Over exposure to these damaging rays can lead to premature cataracts, photokeratitis (snow blindness) and retinal damage. 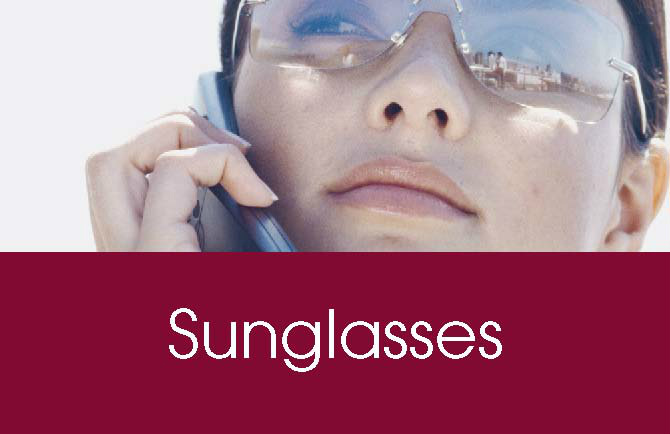 A tinted lens absorbs harmful UV rays and thus stops these rays from entering and damaging the eyes. Polarized lenses are similar to tinted lenses but provide more comfortable vision. 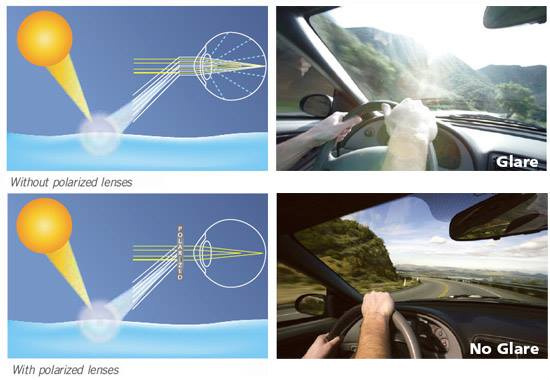 These lenses decrease glare that occurs from non-metallic reflective surfaces such as water and roads. They are ideal for driving as they reduce the glare not only directly from the sun, but also the glare reflected from the road surface. These lenses can also be used for water activities as it minimises reflected light from the surface of the water. This allows less discomfort from the glare on the water top as well as allowing the wearer to see beneath the water surface. 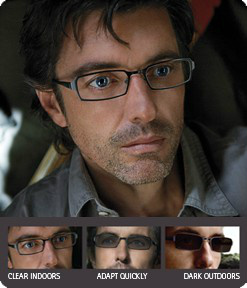 These are also known as photochromic lenses. These lenses are clear when worn indoors and at night but automatically react to UV light to darken. These lenses adapt to the level of light and darken to a shade that suits the wearer's environment. This not only offers comfort to the light but also shields the eyes from harmful UVA and UVB rays by blocking 100% of the UVA and UVB rays. Just as sunscreen protects the skin; these lenses protect the health of the eyes and prevents sun damage to the eye. 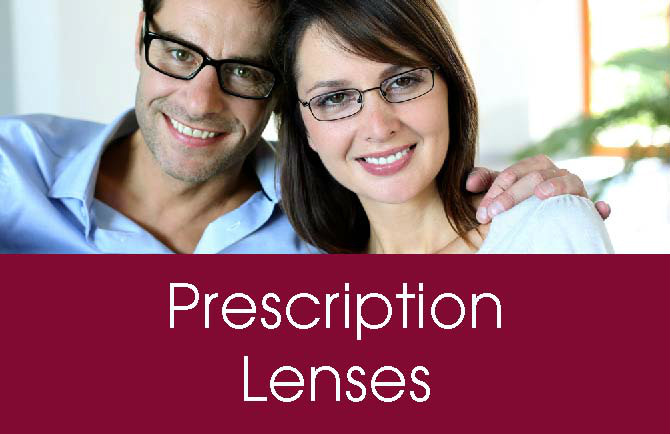 They are available in a wide range of prescriptions and can be worn by all age groups.